Why Choose Saint Rose for a Bachelor's Degree in Music Education? If you dream of sharing your own music experience, seeing your ensemble shine at a festival, challenging middle schoolers with Mozart or Holst, or teaching preschoolers to sing traditional American folk songs, no place readies you as well as Saint Rose. Since Saint Rose was founded, we’ve been successfully preparing music educators to teach in public and private schools. Our rigorous training and hands-on fieldwork ensures that in four years you’ll complete the requirements for New York State certification in music, grades K-12, and graduate as a skilled, experienced music teacher who reaches students’ hearts as well as their ears. Start with intensive foundational training in music performance and music theory, progress through key education coursework, and spend your last semester serving as a student teacher. With the guidance of our dedicated, accomplished faculty who have all taught in public or private schools, you’ll develop performance and teaching skills on woodwind, brass, percussion, and string instruments, as well as piano and voice. You’ll learn to connect with your students and share your love of music with them. And you’ll graduate a confident, capable music educator ready to teach general music or direct band, orchestra, or chorus at any K-12 grade level – joining generations of award-winning Saint Rose alumni who not only fill the ranks of music-education leadership locally and nationally, but are the best loved teachers in their schools. All prospective Music in Performance students must audition in order to be considered for admission. 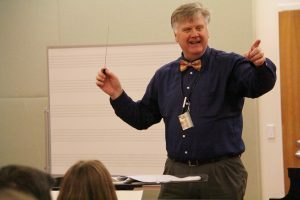 Professor Robert Hansbrough has been named a guest conductor at the University of Szeged, among the many Saint Rose music faculty members invited to contribute their talents at institutions across the country and overseas. Students will understand the elements of musical style, recognizing significant trends, musicians, theorists, literature, and external influences from antiquity to the present. Students will aurally recognize the fundamental elements of music. Students will demonstrate a mastery of a body of repertoire in performance on their primary applied instrument. 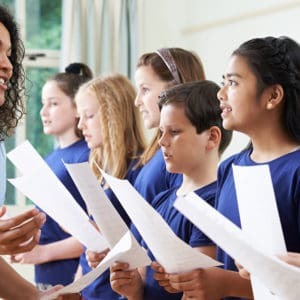 Students will implement teaching strategies that demonstrate content knowledge and foster development, learning, and motivation in the Music Classroom. Students will demonstrate evidence of planning, implementation, and assessment during lessons and/or rehearsals. Students will demonstrate a mastery of rehearsal techniques that include piano skills and conducting. The student will demonstrate a basic proficiency on instruments/voice outside of the primary applied instrument. Saint Rose sang to me. Out of four music schools I visited, Saint Rose blew them all out of the water. The moment I stepped onto campus, I was greeted by the sweetest, warmest faculty I’ve ever met. The facilities are so impressive, and the students are amazing – talented musicians everywhere, equipped with their own different flavor from all over. This is a great place to be for music!